The cuter they are, the better they taste. Although I’ve never butchered a lamb, I did attend a session on it at the recent Taste Trekkers conference. The session included demonstrations on breaking down a carcass and tons of tips on cooking and consuming lamb – information I’m going to share with you! Fun fact about lamb: fresher meat has a milder flavor. If you typically find the flavor of lamb “overpowering”, sourcing out really fresh cuts or eating it in restaurants that serve super fresh, local food should help. Consumers should never buy or order lamb shoulder steak. Steaks typically call for quick cooking, and tough, sinewy shoulder meat needs to be braised. Slow cooking breaks down connective tissue ensuring that meat is tender and flavorful. The “quick cooking” parts of the lamb include the loin and rack – that’s it. Every other muscle region involves slow cooking. Do you know why lamb is typically served with red wine? 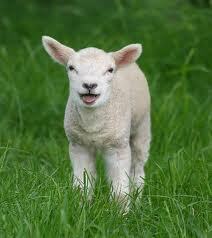 Lambs are fat little creatures, and this carries over into any dish made with their meat. Cold beverages can congeal liquid lamb fat onto the roof of your mouth, making for a very unpleasant experience. Room temperature beverages, like red wine, should complement lamb flavors and not affect the consistency of the fat. Here is an awesome idea for lamb enthusiasts: make lamb pancetta! Find a butcher and get some lamb belly – you should have two slabs. 2. Braise for three hours in the oven with mirepoix – the lamb should be covered in liquid but the dish should be uncovered – no lid. 5. In the morning this should become one piece and you can cube it up and use it as lamb pancetta! Crisp it up and add to salads, or use pancetta instead of butter (or some other form of fat) to add a new flavor dimension to your dish. I’m envisioning Spring Pea and Ricotta ravioli from Dave’s with crispy lamb pancetta, fresh mint, and a nice Parmigiano-Regiano sprinkled on top. A drizzle of some buttery, extra virgin olive oil and touch of balsamic glaze should round out the flavors nicely! Full disclaimer: I haven’t tried this recipe yet and I’m not entirely sure what temperature to braise the lamb at. The Joy of Cooking should be able to clear that up. This is just an awesome idea for you adventurous chefs out there. If you try it, send a comment to let us know how it turned out!